Halloween is just around the corner! While stores are exhibiting their candy and sweet treats, we want to share some deliciously healthy alternatives! From apple monsters to cheesy broomsticks, we have a variety of treats that everyone is sure to enjoy. Check out our five favorite healthy treats below and a tasty surprise at the end! A classic snack made fun for everyone! This snack is as simple as it gets, sliced apples, peanut butter and chopped nuts! 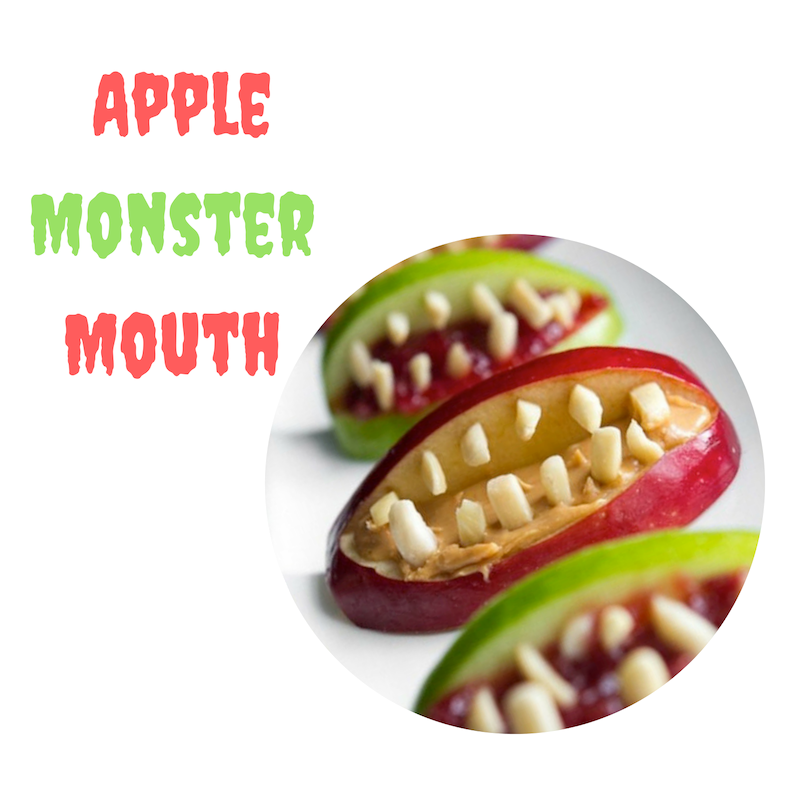 Apples and peanut butter are an all time classic snack that will definitely be a big hit at your next Halloween event. Add these spooky eggs to any salad or just add any seasoning of your liking and eat it solo! It’s a fun way to get your kids eating healthy. Pack this in their next school lunch and sneak one in for yourself too! Having a tasty glass of wine this Halloween? Accompany it with this cute string cheese and pretzel broomstick snack! You can eat this tasty snack at your home Halloween party or just have it as a cute snack for guests this spooky month! Chocolate dipped bananas are old news! Try the new delicious trend of yogurt dipped bananas that make a tasty treat extra healthy! This treat includes half a banana propped on a Popsicle stick, yogurt, mini chocolate chip eyes and black colored chocolate mouth. Take this tasty treat to a children’s or adult Halloween party! These delicious candy corn kabobs are made up of yummy fruit! The fruit used for to create the candy corn color scheme are bananas, melon and pineapple all placed onto an orange Popsicle stick! A great thing about this yummy treat is that it can be replaced with other fruits such as jicama, orange. This is the perfect treat for an office party! Wash down all those yummy snacks with a green witches brew! This recipe calls for three simple ingredients: Nice Matcha Green Tea, water and ice to taste. This is a great alternative to any sugary drinks and it’s just as good! Share your treats with us! Follow us on Facebook + Instagram for weekly inspirations and more.